First, the winner of the book giveaway is (drum roll please)...Dawn Wright! Congratulations Dawn, I'll send it your way this week (Lord willing). I think you will thoroughly enjoy the stories!!! Second, I'm proofreading a revision of Doorposts' very first book titled "For Instruction in Righteousness." 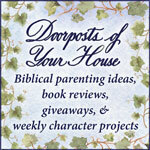 The author is my friend Pam Forster, and I want to encourage you all to go to Doorposts website and check out their materials, designed as parenting tools for raising up godly children. We have and make use of a large number of them and am happy to recommend them. Third, one of the reasons I take on short-term jobs like proofreading is to help raise some funds for those who are adopting. My friend Erica, who I have mentioned a number of times before on my blog, is getting very close to being able to go to Ethiopia to meet her daughter Zarah. I'm full of anticipation to see how God is going to provide the remaining needed funds...I know without a doubt that He is able. I'm so glad my Father has enabled my family to be a part of Zarah gaining the status of "member of the Shubin family" with all its accompanying rights and privileges like having a mommy and daddy to tuck her in at night, having someone to run to when she scrapes her knee, being prayed over and taught about our Mighty God daily, and on and on. I just got off the phone with Erica about an hour ago...what a joy she is! I wish you could all know her. I love this gal...if any of you want to be a part of Zarah being able to come home, please hop over to Erica's blog and do what God enables you to do in this beautiful story He is writing. And fourth, a couple nights ago one of our sweet young friends broke her arm badly. She had surgery yesterday and we went to visit soon after she was coherent again. More than once tears were brought to my eyes as I heard her parents tell of her singing hymns to herself while lying in great pain, of her commenting that she was glad it happened to her and not her littler sister, and other sweetnesses that are wetting my eyes again as I think of them. Difficulties often show ones character much more clearly than easy days, and I just want to go on record saying how thankful I am to God for knitting the hearts of this young lady with those of my daughters in friendship...our whole family loves her whole family, truth be known! We are grateful for your example Rosemary! Keep singing sweetheart...Jesus knows what He is doing. God bless you readers...thanks for stopping by! what a sweet sweet spirit....God hears you sweetie! !